The Winged Euonymus (yew-ON-a-muss),also called Burning Bush, comes from northeastern Asia and is justly famed for its scarlet autumn foliage. One of the hardiest of the euonymus shrubs, winged euonymus is deciduous, losing its leaves in the fall. Its branches carry distinctive corky "wings", or ridges, making this shrub all the more interesting when the leaves have fallen. The winged growth habit persists for about 9 to 10 years. As a bonus, winged euonymus is practically immune to attacks of the major euonymus pest, scale. Winged euonymus typically grows as tall as 15 to feet, spreading nearly as wide, if not wider, as it is tall. A dwarf variety,`Compacta', grows to less than 6 ft. Winged euonymus is a moderately slow grower. Winged euonymus' yellowish-green flowers are unobtrusive. Appearing in May to early June, they cluster 3 on a stalk. In their place in the fall small fruits in pink hanging pods appear. The birds like the seeds, but they are reputed to be poisonous to humans. Winged euonymus leaves are 1 to 3 inches long, 1 to 1-1/2 inches wide, and are arranged opposite one another on the branches. They are shaped like pointed elongated ovals and their edges are gently toothed. They are smooth on top, slightly downy underneath. Dark green in season, these leaves turn bright scarlet red in the fall in the midwest and south as well as in the north. Like its fruits, euonymus leaves are reputed to be poisonous. After they fall this shrub's lovely green-brown stems with their distinctive wings show attractively in the landscape, especially after a snowfall. `Compacta': Grows 6 feet high, spreads to 6 feet wide. 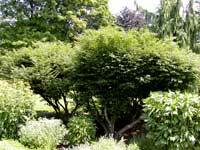 May reach 4 feet in height in 7 years; `Monstrosa': A more vigorous-growing form of the winged euonymus.